The smell that workbenches are made of. As I have made my way around the blogging world since December, I have to tell you, the folks in this community are pretty top notch. I am so happy that all of us, though we might be brand loyal in our hearts, support each other no matter the subject. It’s a pretty great place to share. Just a lead-in to let you know that I’m adding a new category entitled: Owner’s Guides. (Shh…it’s all about Chevy’s, so far). 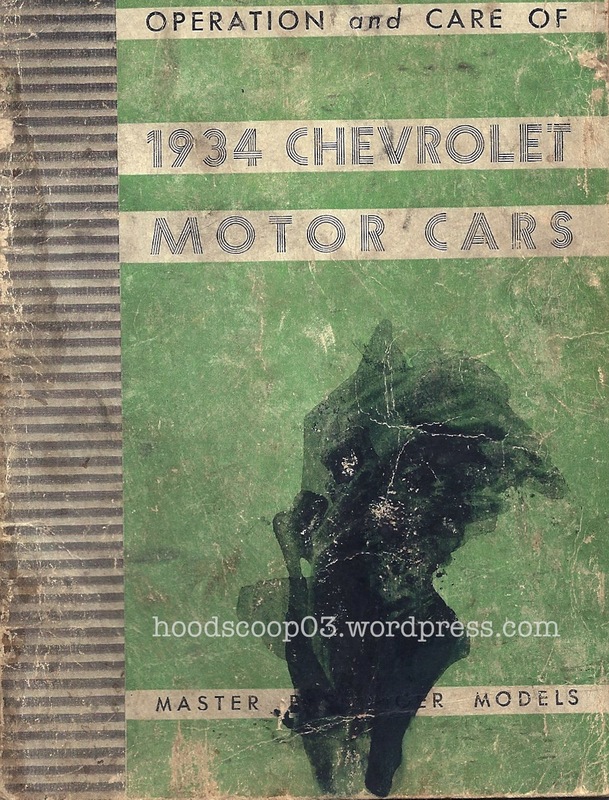 I revisited a stack of car manuals, rich with history, that belonged to my father, great shape and extremely well and very differently written than those of today. I wonder why things aren’t as well written today. Heck, I just bought a new Canon Power Shot camera. Opened the box…no manual. They tell me it’s because things change too quickly. Which makes me wonder why “New” is never as good as the “New and Improved” that will be introduced in 6 months. So I dedicate this and future Owner’s Guide posts to my father who was our original Chevy guy, and my mother, who has carried on our family loyalty to the Chevy brand. This is of course the most weathered of the bunch, but not as you would imagine. It doesn’t have a musty smell, but one of motor oil. The smell that lingers about workbenches and holds garages together. The smell that rises from your hand (no matter how much Goop you’ve used before going into the house so you won’t get into trouble from the wifey). This is a smell that has never bothered a real motor head. A smell that mixes with the taste of a cold beer at the end of a long day on the driveway. Pages and staples are all in tact. One stain on the front. The Chevy Bowtie logo is very discreet in the upper left hand corner, a bit different from our present-day commercial riddled world. Page 7 indicates that there were 9 factories in the US. Flint Michigan boasts the only original factory that I could find. 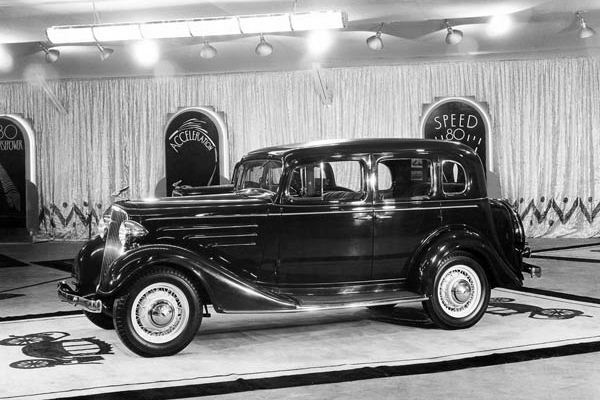 Page 8 tells me that the 1934 was a straight 6 cylinder with 26.3 horsepower. On Page 9 I found this awesome bit of advice: “A new car should not be driven faster than 30 miles per hour, for the first 1000 miles.” Whoah! Octane Selector on Pages 13 and 14 was very interesting. If only it were that easy! 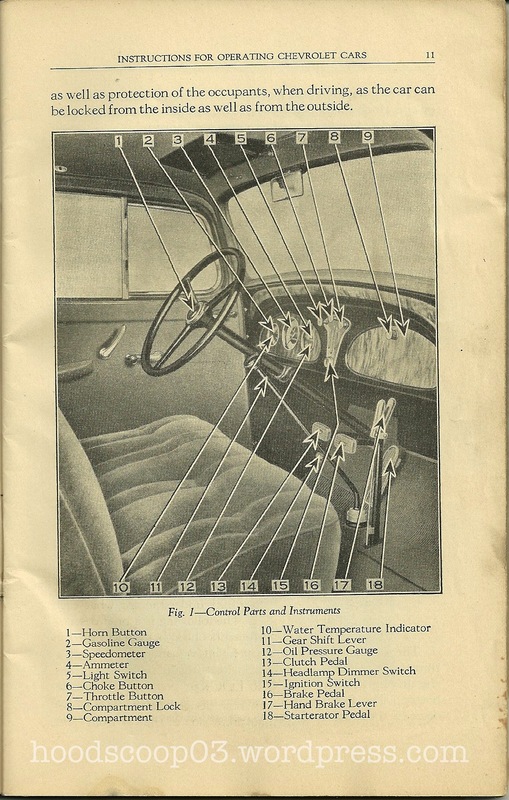 There are 6 rules posted on Page 28 for the 1934 driver in the Manner of Braking. #5 certainly wouldn’t fit in today’s world of the hurried motorist, the unobservant cell phone user, and those gifted in the art of drifting. It reads: “A skillful driver never de-clutches his motor until the last moment as the compression, of the engine, on closed throttle materially helps to slow down and stabilize the car when stopping”. 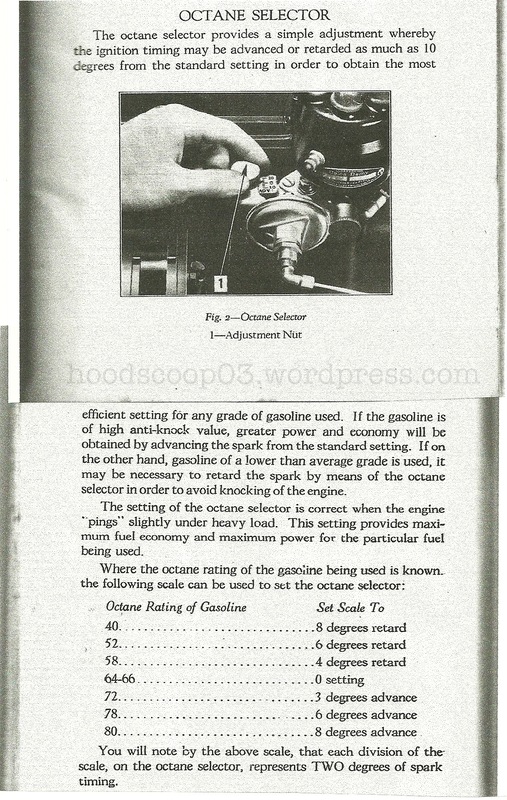 Page 39 Ethyl Gas: “Our experience with Ethyl gasoline for the past few years indicates that it is a satisfactory fuel for use in Chevrolet cars.” I would certainly have cranked my selector to 8 degrees advance! Cooling System: “…kept full of clean water…it is not a good plan to put anti-leak compounds, corn meal, bran or other substances in a radiator, to stop a leak.” The guide at this time even provides directions on making your own ‘Anti-Freezing’ solutions. Chapter 4 spends 11 whole pages on Lubrication, and Chapter 5 wraps up the manual by discussing the care of “a Body by Fisher…with a Duco Finish”. “The Duco finish on a motor car possesses the merit of improving with age, at least, for several months, if the car is properly cared for and not subjected, unduly, to the elements. An occasional polishing with Genuine Chevrolet Polish will restore the luster of the finish. Never use Furniture Polish (can you imagine!?)“. My father was born in 1939, and never owned a 1934 Chevy so his father may have passed on the manual to him. What a great feeling knowing that I have kept these manuals over the years. I must have gathered them up from one of the workbenches or the bottom drawer of that big, red Craftsman tool chest in our garage after my dad died. Over the past 33 years I have bumped and landed in many places, always taking with me the box marked ‘Dad/Papers’. So glad to have found these old manuals in that tattered box. Little did my dad know that my 18 years with him were enough to gain my very own ‘guide to life’. Not one word written, no pages dog-eared, and no worn cover. Just a heart filled with guidance, how-tos, and tips to make it in this world. Thanks, Dad! Aside | This entry was posted in Owner's Guides and tagged 1934 Chevy, 40 weight oil, ACDelco, Chevrolet, Craftsman Tools, Duco Finish, Ethyl Gas, Fisher Body, Flint Michigan, Joyce Kekeisen, Octane, Owner's Guide, Owner's Manual, Rich Stepp, workbench. Bookmark the permalink. How cool. There will be people out there who will give body parts for those manuals. Good luck with getting them on there. My pleasure to read your blog as ever Debbie. Yeah, I must admit my car is old school like you say, if it don’t work I can adjust something with a spanner and it should work again. Keep up the good work. Shhhh it’s a Chevy though. Lol. I can’t believe the manuals section you have started. Here’s why, yiu beat me to it. Lol. Not that I have any chevy stuff but I hav already started my Mustang owners guide I got with my car. Its a great idea for you and I expect it will be popular. I will wait a little while before I post mine. Great minds and all that. Forever your blog buddy. Mart. Mart, please post now and often about your Mustang owner’s guide! You always have a great way to write from the heart. PS Thanks for your words of confidence. Looking at one of these manuals kind of puts you in the shoes of those that lived in that time and drove those amazing cars. Douglas, So glad you read and liked this post. It was a 5 hour labor of love, from the writing, editing, scanning, watermarking, ohmy! I loved diving into this manual. I can’t believe the simplicity and care that danced around these original cars. My wife is so awesome. My favorite lines of the story…”The smell that lingers about workbenches and holds garages together. The smell that rises from your hand (no matter how much Goop you’ve used before going into the house so you won’t get into trouble from the wifey).” Your imagery is perfect and put me back to my days at Mom and Pop’s and that can of Goop in Pop’s workshop. Thank you for that. Thank you, Brad for your wonderful compliment. So glad you were taken back in time to some great memories. I too remember the smell…your dad always had plenty of red shop towels. One always seemed to be hanging out of his back Levi pocket. I think that Goop in them help me get them clean and ready. I had forgotten all about those red shop towels. What a great vision of Dad. PS You’re a pretty awesome mom!! It’s the ‘guide to life’ and life as well for some of us (including me)!! Hey Sid! Thank you so much for your comment. As time allows I will try to continue this series. The manuals are treasures and certainly represent the hearts, minds, and talent of their day. I guess (if trade-in time ever comes) I should consider hanging on to my own manual for my boys!